When we first got our cat Broonzey we had her kitty litter in the bathroom. Let me tell you how gross that was. Having kids now we finally decided there was no way we would be able to keep them away from an open litter box on the bathroom floor. Since we don’t have a basement we needed to figure out another solution. My uncle was actually the one who we got the idea for the kitty litter pop hole from. He had some crazy doors and tunnels for his cats and dogs to get into the basement and outside. He called it “The Pet entrance and exit system”. Ours isn’t as crazy but I think it’s a great solution. 1. Cut opening in drywall: We took the wall that one side is our mudroom and the other side is the garage. We took a drywall saw and cut a hole that was about 5×5 into our drywall. We made it big enough so that our cat could get in and out easily. This is where you use a flashlight to check if there is anything unusual in the wall like electrical wires. If there is then this might be more of a difficult project. If there’s not you can use your drywall saw or some other type of knife and cut another 5×5 square directly on the other side of your drywall into your next room. Now you’ve got your pass through for your cat. 2. Make the box to hold your litter box: Using any leftover material you have or new plywood from home depot, now you will make your large box for your outside to keep the kitty litter in. We made the box pretty much the exact size of our plastic litter pan. Cats seems to throw litter everywhere and with no gaps on the side the litter stays pretty contained. 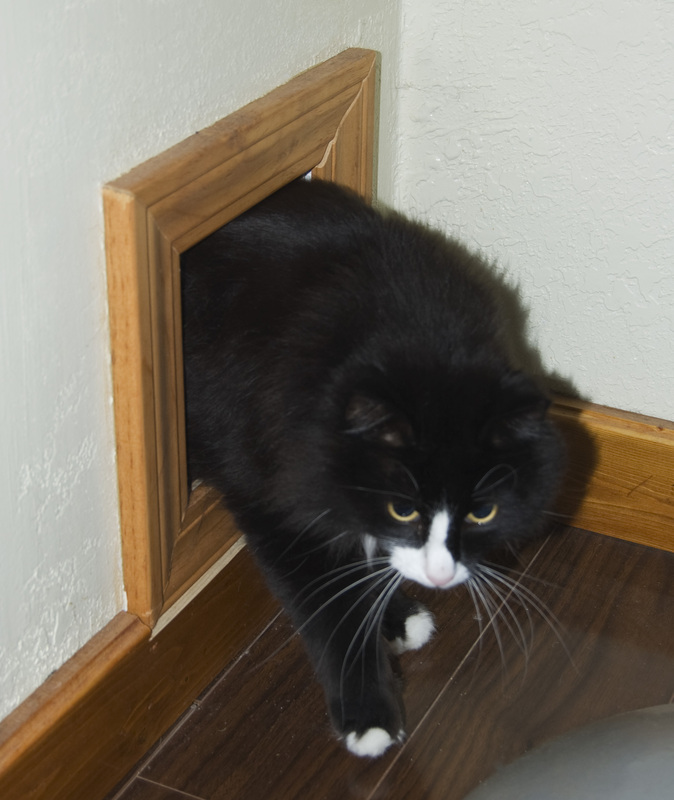 Measure your kitty litter box and make a box that will but up with the wall outside. Our lid was just a piece of plywood we laid on the top but you could get all fancy and put hinges on it. 3. You will have a space between your drywall that you need to cover up. We used some thin wood and made a square to the measurements of the gap. 4. 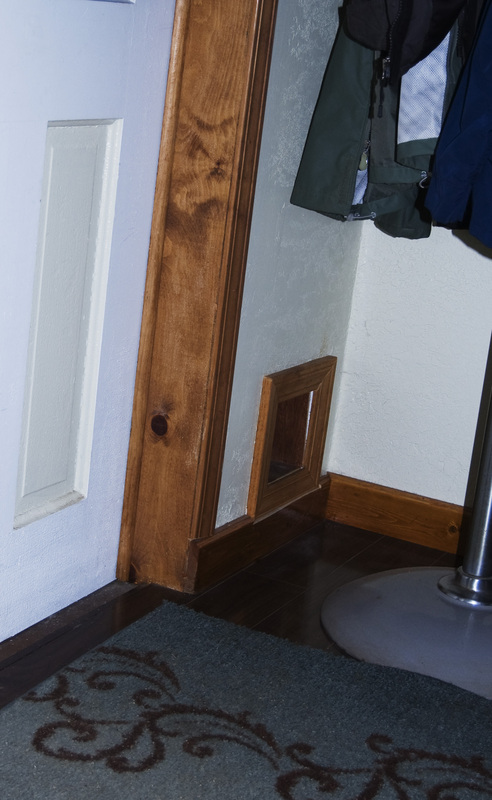 The final step is you take some old door trim you have lying around or go buy a chunk and use it to finish the entrance to your new kitty litter box! I hope this helps you as much as it helped us. I love having the kitty litter out of the way. 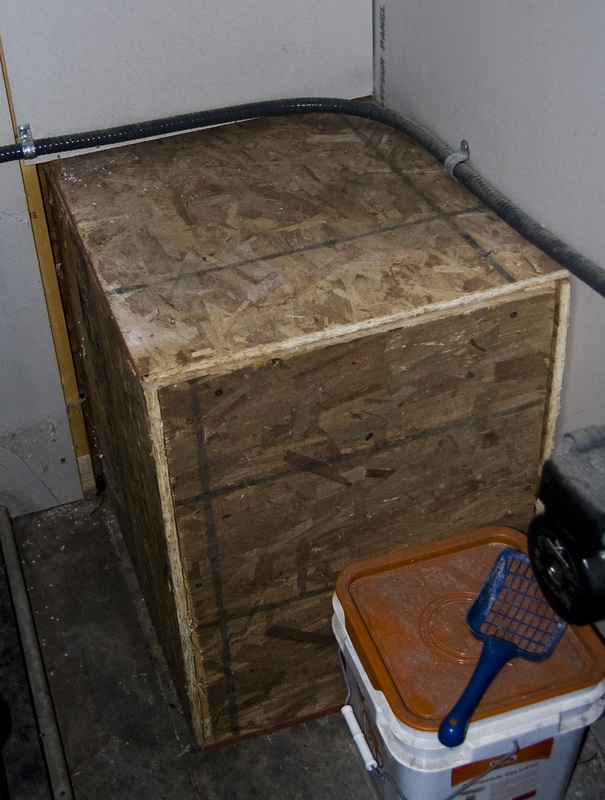 You could make the new box in the garage or from the hallway into an unused storage closet! That is impressive! I don’t have cats but this just opens a can of ideas for me. Way to think outside of the “box”!